You can almost taste the deliciousness in this cake. It is complete and utter decadence. 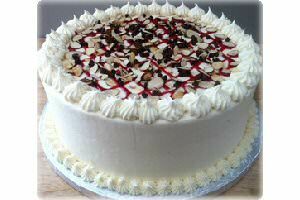 So many wonderful sweet treats, chocolate cake with a raspberry filling then wrapped in a white chocolate cream cheese icing and then crowned with raspberry puree and lots of toasted almonds and mini chocolate chips. It’s an explosion of flavor. Gerald's Desserts lives up to its title, 'Best Desserts and Bakery', made from scratch and only the freshest of ingredients. Please view our many desserts and sweet offerings. Gourmet-Food has over 30 selections sure to catch your eye. It is a 9-inch chocolate cake and serves 8-10 people. The Chocolate Cake with Raspberry Filling is handmade, freshly baked specifically for your order and will ship 2 business days after your order is placed. It will be shipped directly from the baker in its own thickly insulated shipping box, packed with dry ice, and will incur a separate shipping charge. Ingredients:pure canola oil, cake flour (enriched bleached flour [wheat flour, niacin, reduced iron, thiamine mononitrate, riboflavin, folic acid] contains wheat ingredients), sugar, eggs, milk (pasteurized homogenized milk and vitamin D3), vanilla (vanilla bean extractives in water and alcohol [41%]), baking powder (cornstarch, sodium bicarbonate, sodium aluminum sulfate, monocalcium phosphate), baking soda(sodium bicarbonate), cocoa, salt (calcium silicate, dextrose, potassium iodide). Cream cheese icing: confectioners sugar (sugar, cornstarch), butter (cream, natural flavoring, contains milk), raspberry filing (raspberries, sugar, fresh lemon juice), cream cheese (pasteurized milk and cream, cheese culture, salt, stabilizers [carob bean and/or xanthan and/or gar gums], allergy warning: may contain traces of salmon, tree nuts and soy. vanilla (vanilla bean extractives in water and alcohol [41%]), semi-sweet chocolate chips: (sugar, chocolate cocoa butter, milk fat, soy lecithin, natural flavors), almonds.